One effective way to collect information to get buy-in from your managers is to use the Five-Prong Approach (FPA). The FPA includes five types of content that will help persuade your audience. This presentation isn’t the plan itself. The plan is a significant document that needs to be carefully studied. This is the high-level presentation that you create to get buy-in to move forward and then flesh out the plan further with stakeholders. After you have made this presentation and, you hope, secured buy-in, you have to schedule meetings with the specific stakeholders who will weigh in on their particular areas of responsibility. Definitions of concepts that underpin your project: You need to identify and explain the concepts you are discussing. Never assume they are understood by everyone. Present your definitions at the start of your presentation. Also at this time, ask anyone who is unclear about a term you use to speak up during your talk. Even when people claim they understand what a concept means, that understanding may differ from your definition in some way. You want everyone agreeing to the same thing, so make sure to provide your own definition for anything that is new or open to interpretation. Example: Begin by defining the concepts that you believe are crucial to understanding the project. In this example, let’s define how two terms differ: Content Marketing Strategy and Content Strategy. It’s important to note to all involved that you have to deal with both content marketing strategy and content marketing to do a thorough job. Content Marketing Strategy vs. Content Strategy: A content marketing strategy will serve your customers by providing them with the information they need to use our products and love our brand. A content strategy details how specific content will be created and distributed to customers. Statistics and proof that others have succeeded with similar initiatives: Proof is critical when you are facing a group of executives. These people need evidence in the form of data so that they can convince themselves that your plan can work. More important, they want to be able to convince their upper management, if need be. A story about how it worked: Find a story about another company (in the same industry, if possible) that has succeeded using the strategy you recommend. Make sure to call out major revenue successes when applicable. Xerox couldn’t differentiate itself from their competitors. Most marketers believe that a large company like Xerox would have no problem standing out from the crowd, but in today’s attention-grabbing marketplace, no one can be complacent. The company needed to reset the conversation with executives to focus on how it solved problems for real customers, not just repeat the generic “We solve problems.” Many of its competitors were making the same claims, and buyers had a hard time investigating the differences. Xerox also needed to bypass the gatekeepers who prevented the company from reaching the C-level audience it was targeting with its marketing collateral. The audience would toss out anything that looked like an ad. 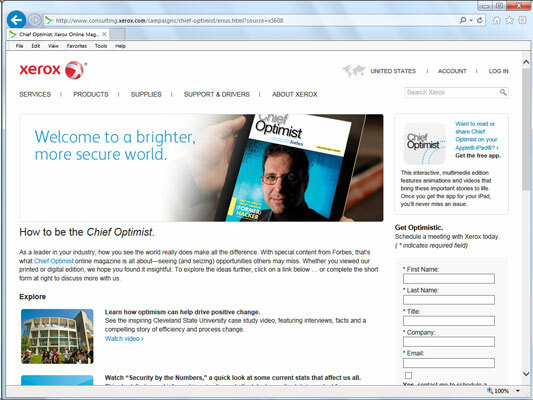 To solve these problems, Xerox partnered with Forbes to create a magazine called “The Chief Optimist.” It contained information about how Xerox was working with particular customers and solving problems, and it had tips from executives. Because the companies packaged this offering as a magazine, gatekeepers didn’t toss it when sorting administrative mail. Also, they created a digital version that included video, which they announced via email. A slide with that quote on it would get any manager’s attention. Obviously, not every company has the resources that Xerox does. But the model holds. If you provide premium content to your targeted market, you will get your customers’ attention. Try to include more than one success story to indicate that one example was not an anomaly. Visuals: You need compelling images to add color and break up all the text. In the upcoming example, you see how to depict your proof as graphics. You should also include any other visuals that tell the story. Example: How about supporting visuals in a well-designed magazine? In the figure, you see the cover of the Xerox magazine. A magazine with interesting visuals will help you make your point. Time to listen: At the end of the presentation, stop and let your audience know that you have slated time to listen to everyone’s concerns and opinions. Make it clear that you expect to hear from everyone before coming to any consensus on next steps. By using the Five-Prong Approach, you share your most persuasive information as well as uncover objections to the preliminary plans.